Last time my local government’s water supply was direly affected by a drought, and water restrictions were being stringently enforced, and a lot of education about water use was being done … my local government put it in writing that we did not need to (and indeed shouldn’t) use tap water to rinse out containers before putting them in the recycle bin. the various recycling areas (eg councils) cannot even get their act together to provide a consistent framework, let alone work out HOW to deal with this issue now that China no longer provides an easy OUT. most users still have NO idea of HOW to recycle (I still see too many people and businesses putting plastic bags full of recyclable material in the recyclable bin; this is immediately transferred to landfill) or even WHAT to recycle (I see countless examples of used tissues, nappies, banana peels etc in the recycle bin). AARRGGHH! My only (tiny) consolation is that I (hopefully) won’t be around long enough to see this turn into a Soylent Green scenario; but I pity my younger friends and relatives who will be. This is possibly the critical one (and why China now refuses to take recycling from many developed countries like Australia), because recycling is seem as an another way to get rid of waste rather than taking responsibility for ones own action. The level of non-recyclables in the recycling bin is embarrassing to Australia who prides itself on being a sophisticated developed nation. Is that walking or driving? Clearly the petrol used would cause an environmental impact; possibly one that is not offset by the fact that you are recycling. While I full support a container deposit scheme, I am very critical of how that Queensland (and NSW) schemes have been set up. The main problem is they require one to make special trips to CDS facilities which costs the consumer considerable time and money. You can put the ACT in the same group. there was an article about a boy in NSW who collected cans and bottles in the lead-up to the introduction of their system and he was able to deposit around 2000 containers out of the 8000 that he collected, the other 6000 were crushed, damaged or weathered and they wouldn’t accept them. He must have felt crushed… but they’re going to be crushed/damaged anyway, as part of the recycling process! These programs, across a range of states, have been poorly designed and terribly implemented. It’s almost as if governments were more focused on keeping businesses happy than on putting in place a usable recycling scheme. reminds me of when the corner store had empty milk crates outside the store’s door for the return of glass milk botttles. ==> useful logical location is important in order to get people to use things properly. With the recently introduced scheme in Queensland, we’ve put aside the recycle for cash containers. After nearly a month and Christmas we have nearly a small fruitbox of approx 25 containers to cash for $2.50. Wow, we have also half filled our recycling bin twice in the same period of time. Cannot recycle for cash wine bottles or our large size mineral water bottles or even our 2 litre plastic milk containers? Anyone for a Clayton’s? I’ll drink to that. Guess you don’t get cash back on large soft drink bottles either? Guess you don’t get cash back on large soft drink bottles either? No you cant, nor any damaged small cans or bottles, even though they will be crushed after collection. The 10c deposit is a joke - people don’t bother to pick stray 10c coins up from the footpath, so many wont be concerned about continuing in their littering ways, and will continue to throw it out the car window when finished with. Now the container deposit scheme has been in place for some time in NSW, I’m awarding it F for fail. I’m still seeing a lot of new litter beside rural roads in the areas where I cycle, and plenty of old bottles and cans that the collectors leave, since they cant get their measly 10c for them. 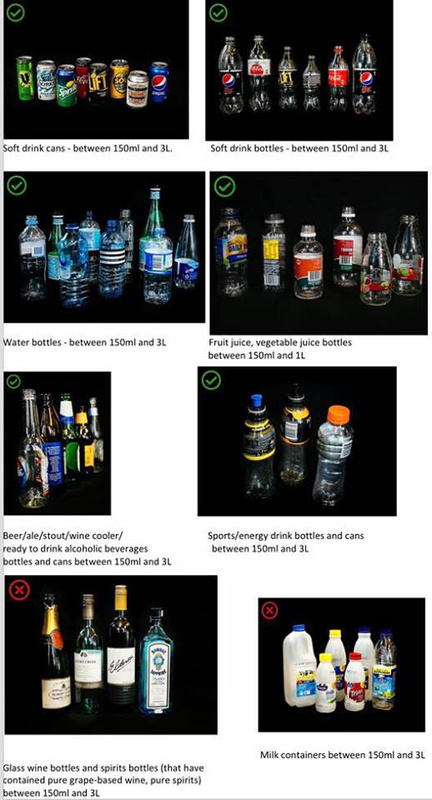 Soft drink containers between 150ml and three litres are eligible - so large soft drink bottles qualify. See https://www.containersforchange.com.au/how-it-works for eligible containers. Flavoured milk containers are eligible (between 150 ml and 3 litres). But plain milk containers aren’t - the difference could be that companies have not signed up for their plain milk containers to be part of the scheme. so large soft drink bottles qualify. Advice accepted. 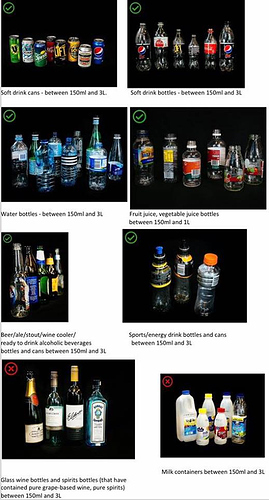 Hope this is also not a suggestion to take up soft drink (recycle the bottles) in place of Australian wine (no recycle)? At least none of our wine bottles to date have a deposit scheme moniker? It would be good if they did! ==>It would be good if they did. Interesting that wine sachets greater than or equal to 150 ml AND less than 250 ml are included in the Qld scheme. ahh,"…soft drink…", not something we ever buy. I was thinking juice, 2l pure fruit juice definitely was not accepted when my wife took them in. What can & can’t be recycled in Queensland. I currently need to dispose of a well used toilet suite. 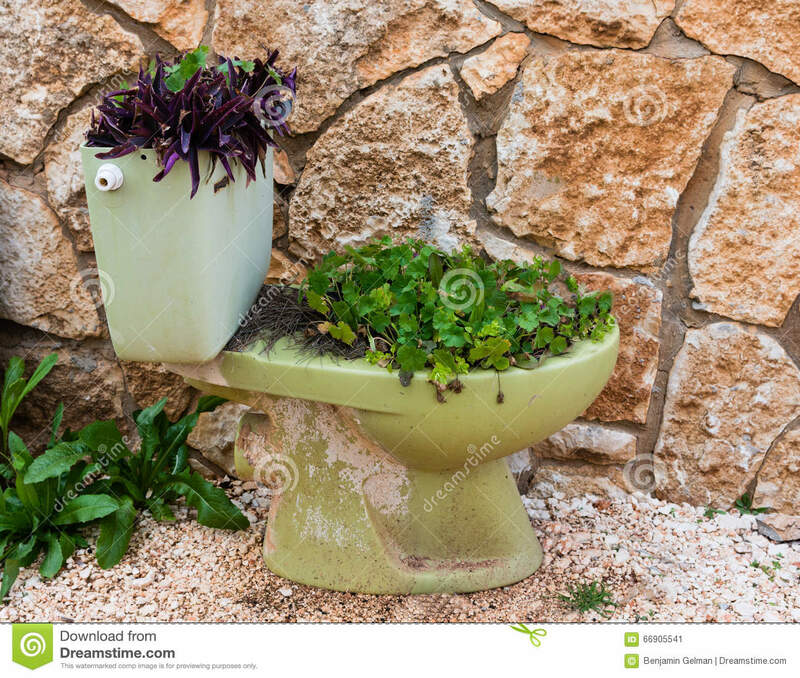 Ceramic based pedestal, hard plastic cistern and seat, bits of rubber baskets and seals, chromed copper pipe, and some stainless pins and screws? 99.9% landfill although all of it could be recycled or repurposed given current technology. It’s just too hard for the council to collect and manage, even if I sorted it out for them. The polystyrene packaging from the new unit goes to landfill too? How much waste is there in a new build and where does it all go? Every piece of plastic in landfill must leave a long term legacy? Copper pipe can be taken to metal recyclers (or to a transfer station as they will have bins for metals). The polystyrene packaging from the new unit goes to landfill too? This morning on ABC Brisbane there was an economist from UQ talking about perverse incentive and other economic theories of why tokenistic levies, very small monetary incentives or bounties don’t work. While it was in relation to the Hanson and Katter cane toad bounties, it is possibly also one of the reasons why the Queensland and NSW recycling levy system is failing to make traction and why post levy recycling rates are virtually the same as pre-levy rates. Interesting listening and what was said makes sense. Hopefully the ABC load the interview onto their website for everyone to listen to. And reserve the last 0.1% for the pipe and pins. Acacia Ridge is a 180 km round trip for 200 grams of expanded polystyrene foam. I’ve taken it previously to the council recycling depot with a load of other recyclicables. They’ve not only told me to put it in the landfill waste bin, they’ve charged $15 for the service! It’s something I can’t change without first getting everyone’s attention! Bring it on Pauline and Bob, while it’s as insane as Bob’s travelling hat which needs an oversized luggage allowance on flights - I will start counting the millions now! Apparently they can breed faster than you can collect them. The big ones also feed on the little ones so taking lots of big ones away only helps more of the little ones grow up. Great idea! Has Pauline asked that they be given citizenship rights now they are no longer immigrants and have lived here for generations. Apparently they can breed faster than you can collect them. Yes, I might even turn the kids pool into a health retreat for the toads. Each female produces about 30,000 eggs each year…that’s a return of $3000 per annum (@$0.10 bounty) per female. When we had one of the toilet suites replaced in our current home a few years ago, the plumber said to simply smash the ceramic pedestal with a hammer. I gave it a couple of hits with my block splitter and it then easily fitted into the green wheelie bin, and the plastic fitted into the yellow wheelie bin. Our local recycling agent said that Styrofoam is one of the very few products which they cannot recycle, but large pieces can usually be broken into smaller sections so as to fit in the green wheelie bin.